Diesel exhaust fluid (DEF), commonly known as AdBlue in Australia, is an aqueous urea solution used in modern diesel engine trucks to help reduce their nitrogen oxide emissions. These days, it is commonplace for AdBlue to be handled, stored and dispensed wherever diesel trucks and engines are fuelled or maintained. With this comes the risk of AdBlue leaks, drips or spills, which not only have the potential to harm the environment, but may affect safety in the workplace. An appropriate, fit-for-purpose spill kit is essential to swiftly contain and control the most likely of spills within a certain area. Such a spill kit will not react with the liquids it is designed to control and allows responders to confidently deal with the spill. Diesel refuelling sites typically use oil and fuel spill kits which contain hydrophobic (water-repellent) absorbents. These absorbents are not suitable for use with AdBlue. 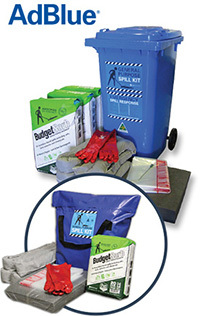 Conveniently housed in blue wheelie bins and bags, our existing range of general purpose spill kits are ideal for AdBlue spills, leaks and drips. Each kit contains a variety of all-liquid, polypropylene absorbents colour-coded grey (differentiating them from our white oil and fuel absorbents). General purpose spill kits are available in a range of sizes to suit your particular application.